Structurally made from bamboo and local River Red Gum for the interior - the large free-flowing (sting-ray-like) structure also caters for a multitude of cosy spaces within this larger volume - shading from the sun and rain. 2. Also by 24H architecture in Chiang Mai, Thailand is the private and Buddhist-inspired Panyaden School - which aims to instill principles of green living into the students - so that the children can become future ambassadors for this way of living. 24H designed a series of organic leaf-like structures inspired by the local antler horn fern, which are organised along a path. 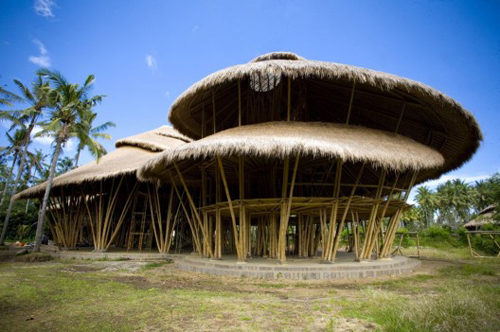 There are two types of structure: the classroom pavilion, featuring rammed-earth load-bearing walls, and glass bottles and washing machine windows allowing light to flood in; and the sala pavilion type, featuring bamboo bundled columns reaching up to the bamboo canopy, used for assemblies and dining. 3. 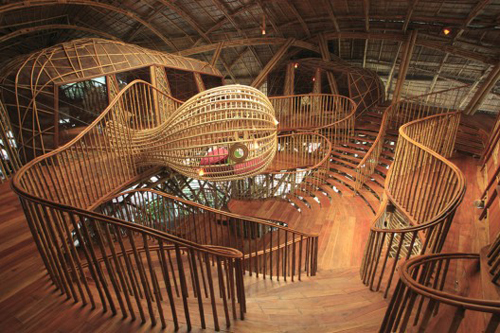 Lastly is the Green School by PT Bambu architects in Badung, Bali, Indonesia - set up by environmentalists and designers John and Cynthia Hardy to demonstrate and motivate communities in the area to live sustainably. One of the ways they are doing this is by showing the locals how to build with local bamboo, where they have also set up a foundation that offers bamboo seedlings to farmers encouraging its use as a building material, thus reducing the further depletion of rain forests. The school is set amidst a lush jungle of native plants and trees and organic gardens and utilises a number of alternative energy sources, including a bamboo sawdust hot water and cooking system, a hydro-powered vortex generator and solar panels. 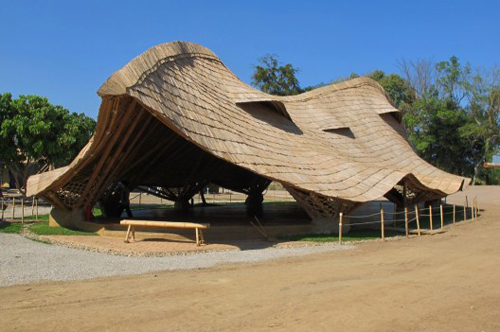 The beautiful bamboo structures range from large-spanning tent-like gathering spaces to smaller classrooms - and shows the multiple architectural possibilities for the material. The school inspires and activates its students to be more engaged and passionate about the environment and the world in which we live.